We are a leading Exporter of thread rolls from Ludhiana, India. We have gained vast expertise in offering a superior range of Thread Rolls that is widely used on thread rolling machine. These are made with best grade quality material with the help of professional technicians as per the international standards. Our range is known for sturdiness, dimensional precision and wears & tears resistance and can also be customized as per the specifications provided by clients. These are very economical. 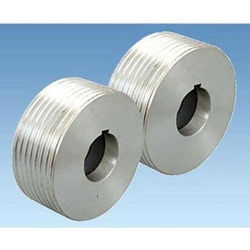 Note : These thread rolls are used on Thread Rolling Machines.These rolls comes in set of 2 PCS./ 3PCS manufactured from D2 & M2 Material to suits any type of machine.For any specification of thread such as ISO,DIN,White worth, American, Trapezoidal Acme etc.